Chiro means hand in ancient Greek. Chirology is the study of the hand, of what your hand says about you. It is no coincidence that, biologically, two parts of the body define the uniqueness of human beings—the human brain and the human hand. Both express the difference between man and beast. There is a saying that the eyes are the doorway to the soul, but the truth is, that the palm of the hand is more connected to the brain(therefore, maybe, to the soul) than any other organ, including the eyes. 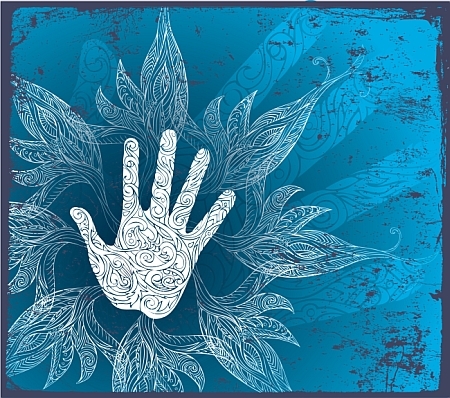 The palm is the brain’s direct instrument and apparently that’s the reason that everything in our consciousness , both conscious and unconscious, finds expressions in some way in the palm of our hands. Diagnostic chirology is personality diagnosis. Its goal is the development of insight and self-awareness. It is an important tool for personal development and for solving personal problems in a constructive and pro-active way. The perspective gained from in-depth diagnostic hand reading is an especially powerful tool during periods of stress, transition and confusion. Diagnostic hand-reading can provide a welcome shortcut for dealing with personal issues at such times. Applied chirology refers to the ability to relate to different aspects of one’s life: emotional needs and tendencies; career traits and employment preferences; health issues. The reading can assess the level of energy, intellectual capacities, strength of willpower, abilities to cope with challenges, self-esteem, self-assurance and ego strength. It also can locate areas of anxiety, stress and frustration. All these raise to consciousness the complexity of every human being within a holistic and supportive approach. From my experience I’ve learned that also the psychotherapeutic process profits from diagnostic chirology, especially if done at the beginning of treatment. There’s especially great value to a chirological diagnosis for people with communication difficulties, when a person is unable or unwilling to express problems verbally, such as children or adolescents. Young people get the most out of a chirological diagnosis during periods of confusion regarding life choices, be they in education, career or employment suitability.